Replacing some of the small, often overlooked accents in your bathroom is a great way to update your home in an inexpensive way. Start with white or neutral paint on the bathroom walls, which is usually less expensive than specialty colors. A new shower curtain and coordinating bath mat can transform the entire look and feel of your bathroom in less than fifteen minutes. If you have just a little more time and a bit of elbow grease, you can polish all the bathroom brass to make it look brand new. Keep a neutral color on your bathroom walls and use accessories to add color. This will allow for quick and easy decor changes. Start by choosing a brightly colored or patterned shower curtain. 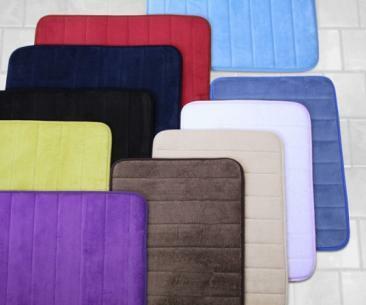 Next, select a bath and shower mat or simple bath towel mat to match. Select accent pieces, such as wall art in vibrant colors, to offset the neutral walls. Finish up by replacing cabinet and drawer pulls, faucets and fixtures. Bathroom fixtures in brass create a polished finish and are easy to maintain. To keep fingerprints and smudges at bay, simply dip a soft cloth into warm, soapy water and wipe clean. Toothpaste can be used as polish in a pinch, or you can make your own polish by mixing equal parts of water and white vinegar plus one cup of flour. Use an old toothbrush to get into any crevices. By starting with a neutral base, you can easily and inexpensively change and upgrade the look of your bathroom or any room in your home by replacing accessories. When updating is this easy, you can do it as often as you like!